What It Is: As many of you know, this month features a ‘bonus’ stat holiday known in most provinces as Family Day (fun fact: I’m partially personally responsible for why it’s called ‘Louis Riel Day’ in Manitoba). This mid-winter break is a time to gather with loved ones and just enjoy your company – without hectic holidays getting in the way. I love that sentiment. 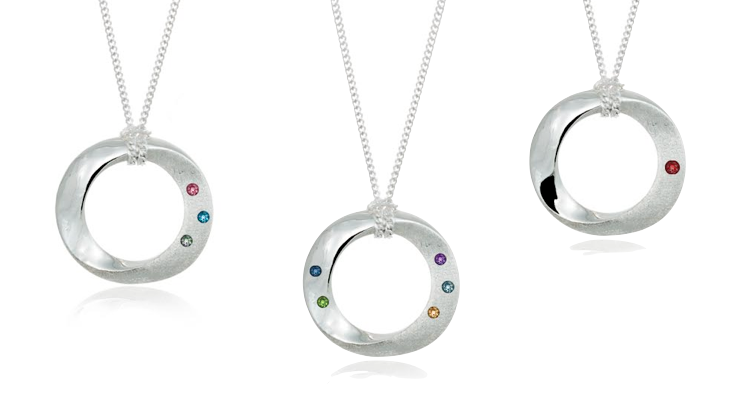 So then, I also by default love the sentiment behind Toronto-based Pamela Lauz Jewellery’s personalized infinity birthstone pendants. I’ve featured the brand a handful of times on here, and in one of my earlier posts I mentioned that one of their signature designs is the subtle take on an infinity pendant. Their birthstone application is equally elegant – you can get your necklace customized with the stones of your entire family for a sleek update on the classic family tree necklace. Or you can opt for a single stone to represent your own zodiac sign. In fact, you can actually design the necklace to be two-sided – making this an extra versatile piece. Whatever the case, this makes a beautiful gift for a milestone birthday, anniversary or even Valentine’s Day. And in celebration of Family Day, Pamela Lauz Jewellery is offering at least 20% off all of the precious stones that go into your custom necklace. So pretty! Even if you aren’t in need of a gift in the immediate future, keep in mind this makes an excellent pick for any time of year – buy it now and take advantage of the rare savings, then save it for Christmas or another special occasion. Who It’s For: Your mom, as a gift from the kids for her birthday. Your daughter, as a way to commemorate the arrival of a new little one (especially if it’s going to be the last child). Your wife, as a sweet anniversary gift that celebrates your family. What It Costs: The pendant itself is $95, while the stone prices vary from $45-$75. However, with this month’s discount, those stones are $35-$60 for a limited time! Where It’s At: The Pamela Lauz Jewellery site has all the details you need to craft your custom piece. 1) First of all: you must be a subscriber to the Canadian Gift Guide to enter this giveaway. It’s as simple as finding ‘The Gift of Gab’ box in the righthand column and dropping in your email or clicking follow. From there, leave a comment below anytime before February 26, 2015 telling me which stone(s) you’d pick if you were creating a custom pendant. 2) Entries are limited to one per person / per email address / per household (or more if you score bonus entries). A random draw will be conducted on or around February 27, 2015 to select the winner, who will have 48 hours to respond before another winner is chosen in their place. 4) Bonus Entry: Like Pamela Lauz Jewellery on Facebook. Then, leave a wall post regarding their Infinity Birthstone Pendant. Finally, link back to your wall post in a separate comment below. You’ve got an extra entry into the draw! I’m trying to decide between the Emerald as my birthstone or the Tpoaz for my daughter. I would pick the diamond stone for myself. I would pick the diamond stone (April)! I would choose the emerald because that is my birthstone. I would pick a garnet. It is not only my birthstone, but I think it would look lovely against the silver. Squeal !! My birthday is the day after Valentines so this stunning pendant would be perfect with my birthstone Amethyst. Absolutely gorgeous !!! Very nice pendant. I would use alexandrite, ruby and topaz for my pendant. Yes, I would keep it! I’d pick Garnet for my January birthday. I would pick my kids birthstones. Opal and Diamond. I’d pick pearl, emerald and diamond for my three kids. Lovely keepsake. I would pick Emerald, Alexandrite and Peridot because my favourite colour is green and all these shades would look amazing together. I’d choose the ruby for my son’s birthday and the peridot for mine. This would be a special family keepsake for me with a diamond, tourmaline and Alexandre. It would be lovely with any stone/stones! My birthstone is diamond and so that would be very nice if I won….. I would choose Aquamarine (march), Peridot (august), Topaz (November. These would represent my husband and 2 kids. I would choose a sapphire for this lovely pendant. It would be a wonderful surprise for my beloved daughter. I would choose Aquamarine, Garnet and Peridot for my three grandchildren – thanks! I would choose an emerald. I would pick 2 August stones, 1 November and 1 February for my husband, two boys and myself. I would choose a diamond, garnet and amethyst. Very pretty, I like the one with the red stone! Love this pendant and the Canadian Gift Guide. I would choose two Topaz (for my son and I) and a Diamond (for my husband). I would pick the February Birthstone Amethyst since my niece Amanda’s birthday is in Feb and I think she would love getting one of these necklaces with her birthstone in it. I’d get the amethyst medium pendant. Very pretty and unusual. I would pick emerald which is my birth stone. I’d pick garnet, my birthstone. I would choose amethyst and ruby for my necklace to give to my daughter. I would choose two emeralds and two alexandrites for my two sons and my husband and I.
I would choose the Garnet for my son, the Diamond for my granddaughter, and the Ruby for myself. I would choose Amethyst, Ruby, Peridot, and Tourmaline because these stones would represent my daughters, their husbands, and my grandchildren. Several of us share the same birth month. This would be so meaningful to me. Love it, I’d keep it for myself. If the prize included one stone, it would be a peridot. If it included three stones, I would choose a sapphire and two alexandrite. I’m a subscriber. I would pick two sapphires, because my boyfriend and I both have sapphire as our birthstone. We are going through a hard time right now, as he is dealing with some difficult things, and I would so much love to give him something like this to help him at this time. Lovely idea, these necklaces – something I will keep in mind. I would pick my granddaugher’s birthstone. I would pick a necklace with a diamond. I would pick emerald as it is my birthstone and also the birthstone of my two sons. I think I would just have two emeralds in it to represent them. I would probably take the diamond one. I’d pick amethyst for myself or diamond for my mom! 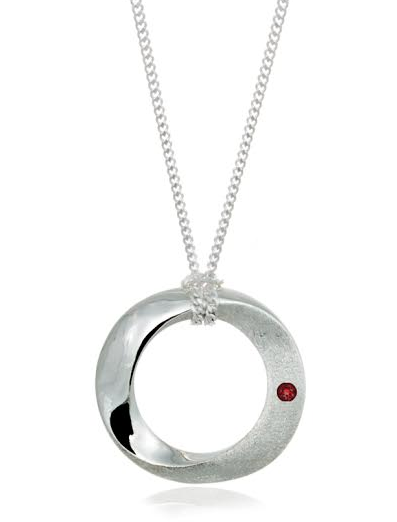 what a beautiful necklace…would pick Ruby for my birthstone! I would get the tourmaline since October is my girlfriend’s birth month. Ruby, Diamond & Sapphire – my & my parents’ birthstones. Growing up, my mom had a beautiful ring with all five of our birthstones (my 2 siblings, myself and my mom and dad’s). It was honestly the most romantic and most thoughtful gift my father has ever given my mother, and they’ve been married for 40 years. I don’t wear rings, besides my own wedding ring, but have always wanted to have something similar to my mom’s birthstone ring. This is not only a beautiful idea, but the pefect solution for my special family peice. I would inlucde the birthstones of my three sons (Emerald, Peridot & Diamond), as well as my husband’s (Aquamarine) and my own (Amethyst). I would pick my birthstone garnet. I would choose Garnet as it is my January birthstone. I would choose my birthstone, cubic zirconia. I would choose a ruby. I would choose a ruby – my birthstone. I would choose a Sapphire stone for September. One Alexandrite surrounded with 3 sapphires ~ that’s my gang! I would pick ruby for me & tourmaline for hubby! I would pick amethyst, emerald, peridot, and citrine – for each member of my family. I would choose alexandrite, Citrine and diamond! I would pick one for February and one for October. I would pick alexandrite and aquamarine.. I would choose a sapphire stone! I’d choose Diamond and Topaz for my kids birthstones. I would get my birthstone which is a ruby. I would choose Diamond and Emarald for the kids. I like Pamela Lauz Jewellery on Facebook. I would choose emerald, amethyst, sapphire and diamond to represent my husband and myself and our 2 pups. I would pick the diamond stone for August, for my daughters birthday! Would adore this for my daughters birthday !! !